With electioneering in the air and all around the 'net, to claim Five Views on The Church and Politics is just in time is classic understatement. In this relatively short overview, five scholars from five theological traditions outline their ecclesiastical traditions' practices, habits, perspectives, and theology of church/government/politics, with government referring to the organized structures that contain and enable political processes of individual or group participation and interaction. The broad descriptive categories echo H. Richard Niebuhr's in his Christ and Culture: Anabaptist – separationist; Lutheran – paradoxical; Black Church – prophetic; Reformed – transformationist; [Roman] Catholic – synthetic. 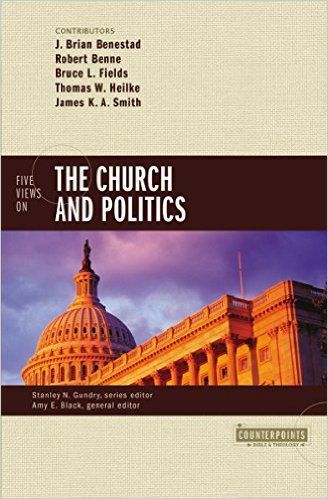 On page 8, General Editor Amy E. Black observes, "Not every theological tradition has a robust and distinctive set of teachings that we might call a 'political theology,' but four in particular stand out for their enduring influence on conversations about church and state over many centuries." On page 229 she reminds us, "By design, this book highlights the differences between five traditions of political theology." Also, you might take note—in this particular book, most everything about contemporary Lutherans references the liberal mainline ELCA; almost all the presbyterian info is about the mainline liberal PC(USA). Counterpoints in the series title refers to each author's rejoinder at the end of each other author's section mostly explaining ways their tradition disagrees – rather than agrees – with the material presented. To be human is to be political. I've tried to mellow a bit, so I'll say in my own experience, to follow Jesus of Nazareth means to be active in ways that help people and the planet get treated with justice and equity, and frequently that means involvement in more formal local, regional, and national politics. In any case, whatever your denominational affiliation, your religious persuasion or lack thereof, reading Five Views on the Church and Politics to get a glimpse of how others have interpreted and lived into the same scripture passages in quite different ways can be an excellent starting point for considering or reconsidering your own responses.